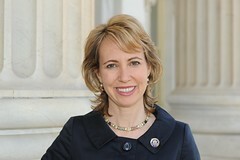 While it’s wrong to argue Sarah Palin is directly responsible for the recent Tucson shooting spree that left six dead and U.S. Rep. Gabrielle Giffords (pictured right) critically injured, it’s equally wrong to argue the shooter acted in a complete vacuum of individualistic mental illness that has no reflection on the current political culture. Palin, as we all know, put Giffords’ district on her infamous weapon crosshairs map designating it a political “target” for Republicans. Some media pundits have claimed the map, to the complete feigned incredulity of GOP leaders and pundits, is small part of a violent political rhetoric that might have encouraged the shooting. Conservative columnist Charles Krauthammer has announced this charge to be “reckless” and “scurrilous.” Palin herself, in a terrible choice of words, called it “blood libel,” evoking an anti-Semitic term. (Giffords is Jewish.) Supposedly, a poll shows conservatives are not taking any heat over the issue. But, as the saying goes, all politics is local. Oklahoma County Sheriff John Whetsel, in response to the shooting, has created a “Dignitary Protection Unit” that will protect local U.S. Reps. Tom Cole and James Lankford, among other dignitaries, at functions in the county. It’s a great idea-the cost to taxpayers will not even be that much because the unit will be made up of volunteers from the sheriff’s office-and I’m all in favor of it, but it seems to undercut the pro-weapon positions of our Congressional delegation and it also seems to indicate that, on a local level, at least Whetsel believes the Tucson shootings show politicians could be special targets these days. What about our other political leaders? If the shooting is just a huge aberration and doesn’t involve political intent, then what’s the point of the unit? If Oklahoma’s Congressional delegation-and this includes U.S. Rep. Dan Boren, a Democrat-believe Glock 19’s and 33-round magazines should be legal and gun background checks should be extremely minimal, then why do they deserve special protection? The point here is they DO deserve special protection because the country’s gun laws lack common sense and there was a political influence in the shooter’s actions even if he is mentally unstable. The country’s political discourse of gun violence-predominant among the right these days-also needs discussion and analysis. Sure, the country has a history of such violent rhetoric, but does that make it right? But why is Chaffetz even concerned? Hasn’t he heard this is just an isolated incident? Surely, as a Republican from Utah, he supports the National Rife Association’s agenda about access to guns. His web site shows he’s a big supporter of so-called Second Amendment issues. As the media argues with itself over Tucson, let’s don’t forget the two main points: (1) A 22-year-old man with little hassle was able to purchase a semi-automatic weapon and an extreme ammunition clip that was once banned by the federal government and (2) there are always political implications in a mass shooting that happens at a political event. The right-wing bastion, with its NRA pro-weapon stances and its disinclination to ask larger political questions about the shooting, are on the wrong side of both points. This includes Cole, Lankford and Boren, who are going to get protected with help from taxpayers for their beliefs or political calculation that make them need protection. I believe if enough bright people would unite and join the NRA and take over the leadership of the group, we could change the laws of the land. 5 million new members that hold reasonable ideas on gun control could make a big differnce in the politics of the NRA.